A doctor may test a patient's knee jerk reflex to diagnose Lambert-Eaton myasthenic syndrome. 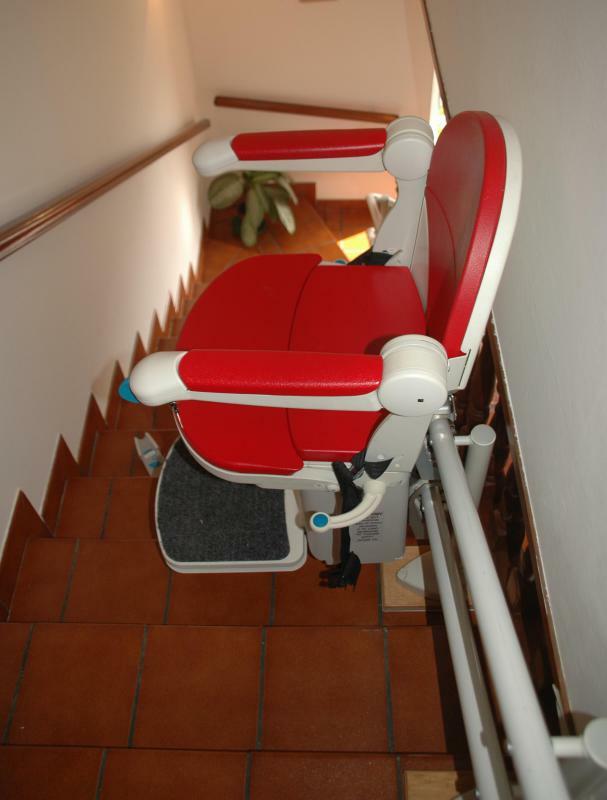 Those with LEMS may need to have a stair lift installed at home to aid in going up and down the stairs. Lambert-Eaton myasthenic syndrome (LEMS) is an autoimmune disorder involving nerves and muscles that results in significant muscle weakness. It is often associated with certain types of cancer or other autoimmune disorders. It is caused by faulty nerve cells that fail to release sufficient amounts of acetylcholine, the chemical essential for the conduction of impulses between nerves and muscles. There are a number of treatments available for the disorder, but serious complications are possible. There are a number of symptoms of Lambert-Eaton myasthenic syndrome. Many of these symptoms can be indicative of other disorders, so physicians must analyze all complaints, in addition to performing specialized tests, before making the diagnosis. The majority of signs are related to muscular control and voluntary movement. Others are directly related to the muscles themselves. Some indicators of Lambert-Eaton syndrome are related to the function of the nervous system. Patients may experience dramatic changes in blood pressure, dizziness or fainting. They may notice muscle wasting or decreased reflex actions. For example, the knee jerk reflex may be diminished or completely absent. Significant muscle weakness may be present, although this may improve with exercise. Many people with LEMS experience difficulty eating and drinking. They may find it hard to chew or swallow food or to eat without choking. A number of vision issues may be present, including blurred vision, inability to focus, or double vision. Tasks such as going up and down stairs, lifting or carrying objects, and changing positions may be very difficult. In addition, some people may find it hard to hold their head up or talk clearly. Serious complications of LEMS include difficulty controlling the respiratory muscles and problems with breathing. When swallowing becomes severely impacted, patients may not be able to receive adequate nutrition by mouth. Due to a reduction in volitional muscle control, people may be more susceptible to dangerous falls or other accidents. Most patients, however, respond well to medical management of this disorder. If an autoimmune disorder or cancer is contributing to a patient's LEMS, treatment of the disorder will initially focus on controlling the underlying diagnosis. Other treatments for Lambert-Eaton myasthenic syndrome include plasma exchange, plasmapherisis and immuno-suppressant drugs. In plasma exchange, donated plasma replaces a patient's own plasma to reduce the number of nerve damaging cells in the body. Plasmapherisis involves separating these harmful protein cells from the patient's blood outside of the body, then putting the clean blood back inside. Lambert-Eaton myasthenic syndrome closely mirrors the muscle disorder myasthenia gravis in a number of ways, mostly in the muscle weakness that occurs with both conditions. The primary difference between the two diagnoses is the fact that with LEMS, the muscles appear to strengthen for limited periods with activity or exercise. This is because the small amounts of acetylcholine being released with each muscle contraction eventually culminate to produce a stronger contraction. In the case of myasthenia gravis, muscles continue to get weaker with each contraction. What are the Different Myasthenia Gravis Symptoms? What are the Different Types of Neuromuscular Disease? What are the Most Common Muscle Disorders?